Ask fellow campers about "Boulder Beach Campground" and nearby attractions. Heads up, wanted to comment that payment is cash only...no checks or credit cards... We camped at Boulder Beach Campground in a Motorhome. Stayed for 4 nights during Thanksgiving weekend, site #22. Was across from dumpsters, but pickup early Friday morning not too noisy. People dropping dumpster lids were more noisy! Beautiful fall poplar colors, eucalyptus trees for shade. Level cement pad and spaces comfortably apart. Fresh water hose at dump site was sliced off?? $3.4 mil renovation starting 11/27/17 to 73 sites. Mostly quiet except for periodic helicopter flights overhead. Sweet find in the desert. We camped at Boulder Beach Campground in a Motorhome. There is a small store near the entrance road that splits...RV village with full hook ups to right $40/ nite and dry camping to left $10-20/ nite. Wood available. You can walk to lake, about 1 mile, but take water...no shade. Many with dogs, but very considerate. As you enter this campground the left side is primarily for tents and is older than the right side. The sites on this side are mostly on crumbing asphalt and the lengths of the site pads are short. The interior road is also not in great shape. There are a number of pull-outs sites on this side. This section also has more trees. The right side has been upgraded (except for loop D). All sites are on a slab of concrete and are pretty level. The concrete is usually long enough to accommodate a large rig with a toe. The interior roads are in good shape. Loop D is closest to Lake Mead but has not been upgraded and looks pretty much like the left side of the park. All loops have a bathroom but no showers. Threaded water spigots are scattered throughout the park. A dump station with fresh water is located near the entrance to the campground. Picnic table and a fire ring (no firewood for sale) are on each site. WiFi and cable are not available. Verizon air card and phone reception was good. Generator hours are from 7 AM until 10 PM. Camp host is currently on Site 34. We would come back to this park. The price reflects the Senior Discount pass. We have a 32 foot 5th wheel. NOTE: ONLY CASH IS ACCEPTED We camped at Boulder Beach Campground in a Fifth Wheel. 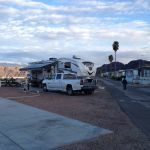 This park is very close to boon docking, But it is a nice park very clean and Right on the shore of Lake Mead. There are no electric, sewer or water hookups in the camp sites so we used solar. There is water at different locations through out the park. I am close enough to one I can actually fill up. There is a dump station at the front of the park that we visit about once a week. There are beautiful trees, bushes and ground cover between the campsites all through the park. I was at a full service park a short distance from here and it was a parking lot. The sun is hot with no shade. This place is very very nice. 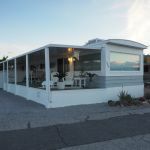 We camped at Boulder Beach Campground in a Fifth Wheel. The campground was extremely clean. Did not have showers, which was a disappointment. There were water spigots available very few sites, and each tent site was raked and clean. The lake was a short drive down the road. We camped at Boulder Beach Campground in a Truck Camper. Try to find a shady spot! It is very hot there, hotter than any other campsite we stayed at in AZ or UT. Beautiful campground on Lake Mead. My fee reflects the America the Beautiful pass. Lots of palm trees and other vegetation, all well-tended by volunteers. Concrete sites, quite level, all with some view of the lake. Concrete picnic tables and grills. No hookups but there is another campground next door that offers them. There is a sewer dump and fresh water fill area as well as water spigots (threaded) near most sites. I would stay here again but not during allergy season. We camped at Boulder Beach Campground in a Motorhome. We arrived the last week of June to stay for a week while exploring Hoover Dam and Las Vegas - I should have checked the weather! It's way too hot this time of year to dry camp here. Highs reach over 100F and lows won't break below 80F. We have a cat and was worried he'd get heat stroke, so moved to the concessioner campground next-door after 1st night here. In cooler weather, we would love it here! The view of the lake and surrounding vistas are incredible. Verizon LTE data coverage was excellent, which is a must for us to work online. This is on National Recreation Land so there is an entry fee good for 1-week. We have the "America the Beautiful" annual park pass, which got us in free. We camped at Boulder Beach Campground in a Fifth Wheel. Hoover Dam is only one exit away. Gas at the first station before you enter Boulder City is the cheapest. Grocery stores and restaurants are abundant in Boulder City. Definitely need to check out this retro burger pub called The Dillinger; amazing food (Yelp has people coming from Las Vegas to eat here)! Beautiful park on Boulder Bay part of Lake Mead, the vistas are breathtaking. National park so with Senior Pass fee to camp was only $5.oo. Right side of park all cement, level pads with picnic table & fire ring. Roads all blacktop & lots of room between sites & even some pull thrus. Dump Station & fresh water available. Dry camp at sites with generators. Lake & Mts visible from most sites. Stayed in motorhome. We camped at Boulder Beach Campground in a Motorhome. This is very close to Hoover Dam & shopping in Boulder City. Many paved bike & hike trails. Approx 45 Minutes to Las Vegas. This park is half way fixed up and revamped and we didn't notice that so our site was unlevel and old, be sure to stay to the right when driving in and you will rate it a 10...they have reworked everything: level concrete sites, long enough for any rig. The bathrooms are still old. The lake is maybe a mile away now, it is sad. We camped at Boulder Beach Campground in a . Nice park with plenty of room. Senior rate with Parks Pass so only $5 a night. Clean and peaceful. Enjoyed our stay and will stay here again if and when we come back through here. We camped at Boulder Beach Campground in a Motorhome. Water is available near restrooms. We paid senior rate of $5.00 with no admission fee because of our senior park pass. On the entrance road, Boulder Beach Rec Area is on L and commercial campground on R. Entering Rec area, on the L side is much older campsites with gravel pads and Very unlevel. Tried 3 different sites on L side before giving up and moving to R side. On the R side is newer campsites with concrete pads, new fire pits, new restrooms, etc. Pads still not level but workable. Lots of space between sites makes it very quiet. Dry camping, no hookups. Only reason for not a 10 is no hookups. This is a gem of a site. We camped at Boulder Beach Campground in a Motorhome. Nice Campground! We wound up staying there a week. Very near Boulder City and Boulder Dam and boat access. Each site is semi-secluded from others, giving a private site feel. Will stay again if in area. 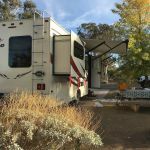 We camped at Boulder Beach Campground in a Fifth Wheel. We stayed here 5 nights with two other rigs from Colorado. The park is very well kept, lots of trees, generous spaces. There were lots of vacant spaces, I have been told it gets pretty busy later in the season. With our senior parks pass: 5 nights cost us $25.00. The only drawback is it's dry camping. It's close to Hoover Dam and shopping in Boulder City. We would surely come again. 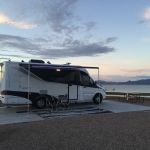 We camped at Boulder Beach Campground in a Fifth Wheel. This is part of the NP system and has been around for quite a while. With our 40' MH it was a tight squeeze but there are a few sites that fit but you have to get there at the right time. It is first come first serve so get there early or during the middle of the week to find a suitable site. Being so close to Vegas it can get very busy on weekends. The dump station is easy to access along with the fresh water. Because of the large trees the view of the lake is minimal unless you are luck to get a site up front. Great bike trails and lots to do. Tours of the dam are very expensive and parking is limited so be prepared to walk long distances. We camped at Boulder Beach Campground in a Motorhome. There are no hook ups at this Lake Mead National Recreation Area campground, but there is a dump station and water is available also. This is a basic but pleasant pleasant park and a good alternative to Lake Mead RV Village (which is right next door) if you don't need hook ups. We paid half the normal rate because we have a Federal Parks Senior Pass. We'd stay here again. We camped at Boulder Beach Campground in a Motorhome. Are you affiliated with Boulder Beach Campground ?